Parents hope their children will be safe when they send them off to school. It’s a fact of life children will develop their sense of independence and responsibility by attending school, but in the last few decades there are more and more causes for adult concern. The dangers children are faced can start even before they enter the classroom, and don’t end until the youngster reaches home. 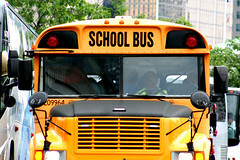 Traffic accidents involving buses underscore the problems with bus safety, and the need for vigilance by those responsible for children’s safety. Several students from Cypress Fairbanks ISD were injured on May 15th when two school buses collided. Little damage was done to either of the buses, and police are investigating the cause of the accident. The incident occurred at around 4:15 p.m. at the corners of Cairnvillage Street and Gretna Green Drive in west Harris Count, in front of the Watkins Middle School. Several students were hurt in the accident, and nine were transported to hospitals with minor injuries. Because most school buses are crowded with children, and few have seat belts or other measures for accident safety even small collisions can result in injury for a child. Among the most cost for children in terms of recovery are loosed or knocked out teeth, neck or spine. Soft tissue damage another risk in even minor accidents in which seat belts are not worn causes as much pain for a child as it does for an adult, and can result in lost time away from school. For parents recouping losses for accidents that occur while the children is the responsibility of other adults is typically a difficult process. Often for those hurt in any accident having legal representation quickly can forestall insurance agencies for denying or undermining a family’s need to seek proper medical care for a child harmed in a traffic accident that occurs during the school day. It’s possible to find help in getting a lawyer who understands the complications of such an accident, and who is familiar with dealing with both insurance companies, and the courts. If your child has been in an accident, and you feel that your claim is not being taken seriously, you have rights. We can help obtain compensation to help with the financial burdens attached to medical treatments, lost time from work, or other issues. You can count on the Houston Accident Attorneys. Contact us today to make an appointment to speak with one of our lawyers. We will your child’s case with the care it deserves.